Patron Self-Registration allows patrons to initiate registration for a library account through the OPAC. Patrons can fill out a web-based form with basic information that will be stored as a “pending patron” in Evergreen. Library staff can review pending patrons in the staff-client and use the pre-loaded account information to create a full patron account. Pending patron accounts that are not approved within a configurable amount of time will be automatically deleted. 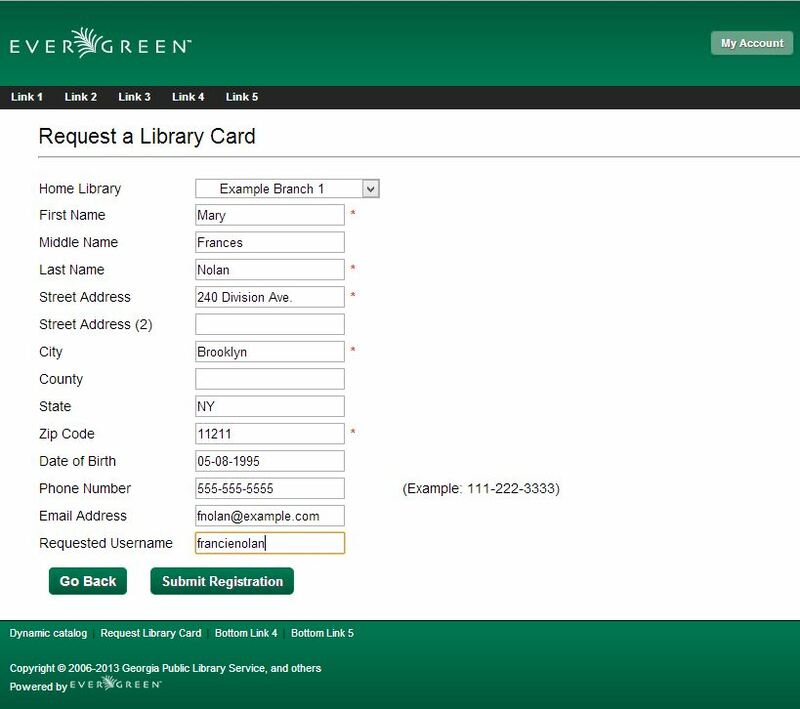 Fill out the self-registration form to request a library card, and click Submit Registration. In the staff client select Circulation → Pending Patrons. Select the patron you would like to review. In this screen you have the option to Delete a pending patron account or Load the pending patron information to create a permanent library account. To create a permanent library account for the patron, click on the patron’s row, right-click and select Load Patron or click on the Load Patron button at the top of the screen. This will load the patron self-registration information into the main Patron Registration form. Fill in the necessary patron information for your library, and click Save to create the permanent patron account. OPAC: Allow Patron Self-Registration must be set to ‘True’ to enable use of this feature. OPAC: Patron Self-Reg. Expire Interval allows each library to set the amount of time after which pending patron accounts should be deleted. OPAC: Patron Self-Reg. Display Timeout allows each library to set the amount of time after which the patron self-registration screen will timeout in the OPAC. The default is 5 minutes.